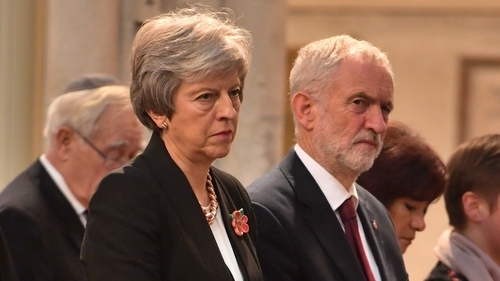 British Prime Minister Theresa May faces a vote of no confidence in her government "soon", Labour leader Jeremy Corbyn has warned. Mrs May has issued a last ditch plea to MPs to back her Brexit deal or risk staying in the European Union. Mr Corbyn said people should "see what happens" on Tuesday, when Mrs May's controversial Withdrawal Agreement is put to a vote in the Commons, but said his party would table a confidence motion "at a time of our choosing". Speaking on BBC One's Andrew Marr Show, Mr Corbyn said: "We will table a motion of no confidence in the government at a time of our choosing, but it's going to be soon, don't worry about it." It came after Mrs May warned of a "catastrophic and unforgivable" breach of trust in democracy if her exit plan is defeated and the UK remains in the EU. With just two days to go before the Commons vote on her Withdrawal Agreement, the Prime Minister pleaded with parliamentarians to "do what is right for our country" and back her deal. While Brexit Secretary Steve Barclay said there had been "some movement" from MPs to support the agreement which is widely expected to be defeated, he said he thought that if it fell the Commons would eventually support something "along the lines of this deal". And he warned of a "growing risk" that parliament could frustrate Brexit, following reports of a plot to change Commons rules to enable backbench motions to take precedence over government business if Mrs May's deal falls. Downing Street said it was "extremely concerned" about the plans, reported in the Sunday Times, which could threaten Brexit legislation and the government's ability to govern. Mr Barclay told Mr Marr: "What recent events have shown, with events over the last week with what happened on the legal advice where the government was forced to act in a way it didn't want to, is the uncertainty in terms of what will happen in the House has increased. "So those on the Brexiteer side seeking ideological purity with a deal are risking Brexit, because there is a growing risk that events could unfold in ways that (mean) they are leaving the door ajar to ways that increase the risk to Brexit." Meanwhile, Liberal Democrat leader Vince Cable said it would be "outrageous and unforgivable" if a no-deal Brexit was allowed to happen, adding: "I think parliament will take control of this process, will insist that we pursue the option of no Brexit." He said this could happen by cancelling Article 50 - which he noted would be "resented by lots of people" - or via a second referendum. Mr Corbyn hinted that Article 50 may have to be extended if his party came into power. He said: "Clearly if Theresa May's deal is voted down, clearly if a general election takes place and a Labour government comes in - an election would take place February, March time - clearly there's only a few weeks between that and the leave date, there would have to be time for those negotiations." Writing in the Sunday Express, Mrs May said: "You, the British people, voted to leave. And then, in the 2017 General Election, 80% of you voted for MPs who stood on manifestos to respect that referendum result. You have delivered your instructions. Now it is our turn to deliver for you. "When you turned out to vote in the referendum, you did so because you wanted your voice to be heard. Some of you put your trust in the political process for the first time in decades. We cannot - and must not - let you down. "Doing so would be a catastrophic and unforgivable breach of trust in our democracy. So my message to Parliament this weekend is simple: it is time to forget the games and do what is right for our country." Transport Secretary Chris Grayling insisted the government has put forward a "sensible compromise deal" before denying troops were being sought to help with no-deal Brexit traffic plans. He told Sky News's Sophy Ridge On Sunday he talks to Defence Secretary Gavin Williamson "quite regularly" about no-deal Brexit planning. But he said he does not have the military "actively involved" in no-deal planning beyond the secondment of a "small number" of staff from the Ministry of Defence. Mr Grayling also said: "I have not asked for military support for the operations in Kent - that will be handled by Highways England and Kent Police."